The naming of a clan is a very sacred process. It is not dictated by the creativity alone of the facilitator, but is rather more of a download of information that best represents the existing energy of the group as a whole. Through intuition, meditation, inspiration, imagination, observation and deep listening the clan is named, not by a human, but through a human by the unseen energy source that connects us all one to another. We are but reflections of one another, until we are reflecting only what is inside of our heart of hearts from our purest essence. And we will then each be one to another the most persistent of reminders of the greatness that lies within each of us. For it is then that we are projecting the most essential part of our highest and finest selves from the very core of our being. And so it is wise to pay attention to everything and everyone that comes into your space. Let no blessing go unnoticed and no message go unheard. Be not fooled by the wrapping paper on the gift or the cover on the book. The power of White Dove is in her absolute purity of heart. This creature is here to bring in peace and a recapturing and drawing down of the innocence of the angelic self and our omnipotent beauty. She portends Angelic Play. Like the innocent asking of one child to another, "Do you want to play?"... with no hidden agenda, no thoughts of anything but to connect with another, soul to soul in the moment. White Dove brings us on her snowy wings into the dimension of eternity and timelessness on the physical plane. In her we find the beauty of each moment and we bask in its glory. With her higher view of the etheric world, she brings us the calm assurance that all is well in paradise, even when things in the physical get a little chaotic. She encircles us in her wings like an eidolon and carries us to our destiny of human potential and magical beauty. White Dove is the embodiment of the divine feminine within us all and she gives life to that for us as she sings us her song. The Dove's coo is a cosmic purr of satisfaction, a love note, a song of serene purity of our own TRUE BEAUTY. On her wings we alight into the free range of inner space. Dove's Campaign For Real Beauty Website has more films and tools for developing self esteem in women and young girls counteracting the negative affects of advertising in the beauty industry. According to their study only 2% of women around the world would describe themselves as beautiful. See links below. 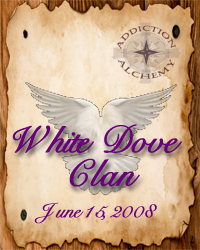 White Dove is a messenger of hope, peace and unconditional love not only of others, but self. She will help you to resolve conflict, to be more serene and tranquil and to surrender and release the part of you that wants to control others and your own circumstances. She will do this by empowering you with an amazing grace. As you experience this grace you will no longer feel the need to squeeze the mystery out of your life by planning and manhandling all of your affairs. You will not only become comfortable with letting go, you will actually trust and look forward to the magic as it unfolds. Each day you will awaken and say, "I wonder what the Universe has in store for me today?". That is not to say that you just sit back and do nothing. Yet, there is not fear of this either. Because of the stillness, the silence in your mind and the serenity you can now hear the clarion call of the Indwelling Spirit as your Angelic Self can now inform your life from an omnipresent and eternal perspective to take guided action. All at once everything matters....and nothing matters. White Dove ushers you into the Gap. She brings you to the part of you that observes what "you" do in stillness, without judgment or condemnation. This carries you into the realm of power versus force and opens you to sweeping, quantum changes in your way of being in the world. If I have come to you, you are ready to receive the Light even more fully into your life. You have been purifying your body, mind and soul and your heart is ready to open to unspeakable love. You are ready to surrender and let go. It's time to fall...to fall in love for real...with you...with your body, mind and soul. It's time to make room in the clutter of your mind and the brokenness of your heart for your Angelic Higher Self to fully enter its host. This is a love that you may have never known before in your life. This is the compassionate, tender, caring, nurturing love which transcends all known tags and labels. This is an unfiltered, unpolluted seeing of self and others and a total honoring of what is seen. Do you look at your self in disgust? Do you wish you could stop smoking, overeating, under-eating, exercising compulsively, not moving your body enough, obsessing about your body parts, quiet your mind chatter and still your soul? Are these things causing you to disconnect from the deepest of love with self and others? If this is so, White Dove is here to bring you freedom. Climb onto my breast and I'll take you to your beauty. In order to do this you must enter my world. Here there are no expectations, there is no yours and mine...not really. This does not mean that you will not speak your truth. But it will be from a place of discernment and not condemnation. You will hold strong to this, as others struggle to respect your boundaries, for it is your deep love that holds the vision high. This love doesn't want to be liked or made popular. This love is a living, breathing force in its own right, unstoppable, universal and unconditional. Come with me, says White Dove, and accept your holiness. You are Goddess and God in the flesh. The kingdom awaits you of ecstasy and bliss in divine union. Your angelic self is being made ready to enjoin with body, mind and soul...Spirit in the Flesh. I am purified by the Light. I am a being of Light. My angelic self merges with my physical body and I am whole. I tap into the omnipresent wisdom of my Higher Self. I channel divine grace for healing of self and others. I am a radiant Light unto the world. I am a Light worker and a healer. My countenance is holy and sacred. I am worthy of the highest forms of love. I am sacred, divine love in the flesh. I embrace right livelihood and bring the sacred into all my works no matter what that may be. Every aspect of my life is sacred. I am a ministering angel. I am a guardian and spiritual warrior of Light. My love for humanity and all creation transcends time and space. I see beyond the veil and commune with Spirit. My soul has been set free. I perfect my ability to express myself with free will. I fully claim my free will. I am guided and moved by Spirit. My connection to my Higher Power and the Eternal Will to Good is all encompassing. My entire life is a prayer, a worship and a sacrament. I am in bliss and gratitude of the beauty and splendor of this world. As a Christian symbol it is of very frequent occurrence in ancient ecclesiastical art. As a symbol of the Holy Spirit it appears especially in representations of the baptism of Our Lord (Matthew 3:16) and of Pentecost. St. Gregory the Great (590-604) is generally shown with a dove on his shoulder, symbolizing inspiration or rather Divine guidance. A dove of gold was hung up in the baptistery at Reams after the baptism of Clovis; in general the symbol occurs frequently in connection with early representations of baptism. In ancient times a dove-like vessel was frequently suspended over the baptismal font and in that case. As a symbol of martyrdom it indicated the action of the Holy Spirit in bestowal of the fortitude necessary for the endurance of suffering. As a symbol of the Church, the agent through which the Holy Spirit works on earth. When two doves appear the symbolism may represent, according to Macarius (Hagioglypta, 222), the Church of the circumcision and that of the Gentiles. On a sarcophagus or on other funeral monuments the dove signifies: the peace of the departed soul, especially if, as is often the case in ancient examples, it bears an olive branch in its beak; the hope of the Resurrection. In each case the symbolism is derived from the story of Noah and the Flood. Such is the meaning of the dove (columbula, palumba sine felle) in numerous epitaphs of the Roman catacombs. Occasionally funeral lamps were made in the shape of a dove. Two doves on a funeral monument sometimes signify the conjugal love and affection of the parties buried there. The dove in flight is the symbol of the Ascension of Christ or of the entry into glory of the martyrs and saints (cf. Ps. cxxiii, 7: "Our soul is escaped as a bird from the snare of the hunters, the snare is broken and we are delivered." In like manner the caged dove signifies the human soul yet imprisoned in the flesh and held captive during the period of mortal life. In general, the dove as a Christian emblem signifies the Holy Spirit either personally or in His works. It signifies also the Christian soul, not the human soul as such, but as indwelt by the Holy Spirit; especially, therefore, as freed from the toils of the flesh and entered into rest and glory. Dove Film Gallery - Must see!